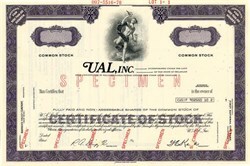 Beautifully engraved specimen certificate from UAL, Inc printed in 1970. This historic document was printed by American Bank Note Company and has an ornate border around it with a vignette of an allegorical man. This item has the signatures of the Company's President and Secretary and is over 36 years old. United Airlines (NASDAQ: UAUA), the primary subsidiary of the UAL Corporation, is a major airline of the United States headquartered in unincorporated Elk Grove Township, Illinois, near Chicago's O'Hare International Airport, the airline's largest traffic hub, with 650 daily departures. Starting in early 2007, United Airlines will move its headquarters to downtown Chicago. As of July 31, 2006, United was the world's second-largest airline in terms of revenue-passenger-kilometers (behind American Airlines), fourth-largest in terms of total operating revenues (behind Air France-KLM, American Airlines, and Delta Air Lines), and fourth-largest airline in terms of total passengers transported (behind American Airlines, Delta Air Lines and Southwest Airlines). United has roughly 54,000 employees and operates approximately 460 aircraft. On February 1, 2006, United emerged from Chapter 11 bankruptcy protection under which it had operated since December 9, 2002, the largest and longest airline bankruptcy case in history. 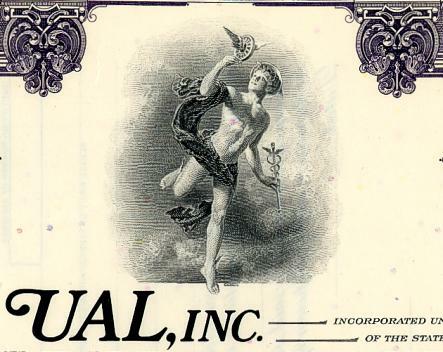 Early beginnings UAL traces its claim to be the oldest commercial airline in the United States to the Varney Airlines air mail service of Walter Varney. Varney's chief pilot, Leon D. "Lee" Cuddeback, flew the first Contract Air Mail flight in a Swallow biplane from Varney's headquarters in Boise, Idaho to the railroad mail hub of Pasco, Washington on April 6, 1926 and returned the following day with 200 pounds of mail. April 6th is reckoned in the United Airlines company history as both its own birthday and date on which "true" airline transport�operating on fixed routes and fixed schedules�began. Varney Airlines' original 1925 hangar served as a portion of the terminal building for the Boise Airport until 2003, when the structure was replaced. In 1927, airplane pioneer William Boeing founded his own airline, Boeing Air Transport, and soon began buying other airmail carriers, including Varney's. Within four years, Boeing's holdings would grow to include a number of airlines, airplane and parts manufacturing companies, and several airports. In 1929, the company changed its name to United Aircraft - Transport Corp.
United Airlines Boeing 777 taking off at Schiphol, Amsterdam.In 1930, as the capacity of airplanes proved sufficient to carry not only mail but also passengers, Boeing Air Transport hired a registered nurse, Ellen Church, to assist passengers. United claims Church as the first airline stewardess. Following the Air Mail Scandal of 1930, the Air Mail Act of 1934 banned the common ownership of manufacturers and airlines. United Aircraft-Transport's President Philip G. Johnson was forced to resign and went on to Trans-Canada Airlines, the future Air Canada. William Boeing's company was broken into three: a parts supplier (the future United Technologies), an aircraft manufacturer (the Boeing Airplane Company), and an airline group�United Air Lines. The airline company's new president, hired to make a fresh start as airmail contracts were re-awarded in 1934, was William A. Patterson, who remained as president of United Airlines until 1963. United's first 727, on display at the Museum of Science and Industry in Chicago.United's early route system, formed by connecting air mail routes to one-another, operated essentially north-and-south along the West Coast, and east-to-west along a transcontinental route from San Francisco to the Midwest and Mid-Atlantic states via Denver, Colorado. The early interconnections made at San Francisco and Denver during this early era became the basis of major United hubs in these cities, and still exist today. During World War II United trained ground crews, modified airplanes for use as bombers, and transported mail, material, and passengers in the war effort. Post-war United benefitted from both the wartime development of new airplane technologies (like the pressurized cabin which permitted planes to fly above the weather) and a boom in customer demand for air travel. This was also the period in which Pan American Airways established a Tokyo hub and revived its Pacific route system that would later be acquired by United. On November 1, 1955, United Airlines Flight 629, which was flying from Stapleton Airport in Denver to Portland, Oregon, was bombed, killing everyone on board. The bomb was planted by a man named Jack Graham, who was executed a year after the explosion . United was an early customer of the Douglas DC-8, which was released months after the Boeing 707, delaying the airline's entry into the jet.The company merged with Capital Airlines on June 1, 1961, making it the world's largest commercial airline and giving it a route network covering the entire United States. In 1968 the company reorganized, creating UAL Corporation, with United Airlines as a wholly owned subsidiary. The airline lobbied for transpacific routes for over 20 years, but its westernmost destination was Honolulu until 1983. United is now one of the world's largest transpacific carriers.United had begun to seek overseas routes in the 1960s, but the Transpacific Route Case (1969) denied them this expansion. It did not gain an overseas route until 1983, when they began flights to Tokyo. By the end of that year, United had flights to 13 Pacific destinations, many of which were with route contracts purchased from the ailing Pan Am. Economic turmoil, labor unrest, and the pressures of the 1978 Airline Deregulation Act greatly affected the company, which incurred losses and saw a greatly increased turnover in its senior management through the 1970s and early 1980s. In May 1981, one week after archrival American Airlines launched AAdvantage, the first frequent flyer program, United launched its Mileage Plus. The Wall Street Journal mistakenly reported United's program to be the first. In 1982, United became the launch customer for the Boeing 767, taking its first delivery of 767-200s on August 19th. Strike of 1985 On May 17, 1985 United's pilots went on a 29-day strike claiming the CEO, Richard Ferris, was trying to "break the unions." They used management's proposed "B-scale" pilot pay rates as proof. American Airlines already had a B-scale for its pilots. Ferris insisted United had to have pilot costs no higher than American's, so he offered United pilots a "word-for-word" contract to match American's, or the same bottom line numbers. The United ALPA-MEC rejected that offer because it meant they would not get their deferred pay raise. The only choice left, to achieve parity with American's pilot costs, was to begin a B-scale for United's new-hire pilots. Ferris wanted that B-scale to merge in the captain's ranks, which was more generous than American's B-scale, which never merged at all. In the final hours before the strike, nearly all issues had been resolved, except for the time length of the B-scale. It appeared that would be resolved too as negotiations continued. ALPA negotiators delivered a new counter-proposal at 12:20 A.M. in an effort to avoid the strike. However, MEC Chairman Roger Hall, who was hosting a national teleconference with F. Lee Bailey, declared the strike was on at 12:01 A.M., on May 17, without consulting the negotiators, who believed they were about to agree on all contract terms with United's management negotiators. That struggle cost the airline $1 billion, and provoked a long period of labor unrest and financial deterioration that culminated in bankruptcy nearly 20 years later. Following Ferris' termination by the board, Allegis divested its non-airline properties in 1987 and reverted to the name UAL Corp. That helped clear the path for the United Pilots to do an ESOP takeover of United, which eventually did happen in 1994. Employee Stock Ownership Plan The fall of Pan Am offered new opportunities for United. In 1991 the company initially expanded dramatically, purchasing Pan Am's former routes at London Heathrow Airport and paving the way for the company's first transatlantic flights. However, the aftermath of the Gulf War and increased competition led to losses of $332m in 1991 and $957m in 1992. In 1994, 55% of company stock was given to employees in exchange for salary concessions from its unions. The Employee Stock Ownership Plan (ESOP) made United the largest employee-owned corporation in the world. It used the opportunity to create a low-cost subsidiary, Shuttle by United, in an attempt to compete with low-cost carriers. There were three previous attempts to form an ESOP at United, in 1987, 1989, and 1990. Fees paid to advisors on both sides totaled $145 million for all four ESOP plans. An internal pilots' union report by Thomas Sullivan (U.S. Attorney for northern Illinois), revealed that "pilot union leaders made secret agreements in 1989 and 1994 to pay millions of dollars in fees to lawyers already on the union's staff or on retainer. They did not disclose these fees to the rank and file." That Sullivan report said that Roger Hall, the United-ALPA-MEC chairman, had authorized a payment of $2 million to Charles Goldstein, who was the union's own staff lawyer, but he did not reveal that to his board. The report also concluded that Hall and Goldstein had violated union rules, and many of United's pilots openly complained that the advice from Goldstein could hardly have been objective if he knew the ESOP had to be successful in order to receive that $2 million fee. Union leaders agreed to let Goldstein keep $750,000 of that $2 million, after he threatened a lawsuit. Hall's predecessor, Frederick Dubinsky, also did not reveal to the rank and file that he had authorized a payment of $375,000 to Goldstein after the failed ESOP attempt of 1989. Both Hall and Dubinsky denied they ever did anything wrong, but Hall did resign upon request of the pilot union board. The Sullivan report also uncovered a $4.12 million "success" fee to be paid to Cohen, Weiss & Simon, which had been receiving hourly billing payments from the union for its work on the ESOP buyout. Again, that fee wasn't common knownledge until after the ESOP was completed. Once that became known, Cohen, Weiss & Simon agreed to return the entire $4.12 million. Turn of the century developments In 1997, United founded the Star Alliance with Air Canada, Lufthansa, SAS and Thai Airways. United was a launch customer of the Boeing 777 and had significant input on its design. It was also the first airline to introduce the twin-jet in commercial service. In May 2000, United announced plans to acquire competitor US Airways in a complex deal valued at $11.6 billion. The offer drew immediate scorn from consumer groups and employees of both airlines. By the following year, regulatory sentiment was against the deal, and United withdrew the offer just before the Department of Justice barred the merger on antitrust grounds in July. The two airlines subsequently formed a partnership that led to US Airways's entrance into the Star Alliance. May 2000 also saw a bitter contract dispute between United and its pilots' union. Planning for the busy summer season, United had counted on its pilots flying overtime. However, the pilots could not be forced to work overtime, and most pilots refused to fly the extra hours. Although United knew they would have to cancel numerous flights if this were to happen, they did not hire new pilots to make up for the potential shortage. Over the summer, United ended up having to cancel a large portion of its schedule at its major hubs. Eventually, CEO Jim Goodwin and the rest of the management had to get the pilots back in the cockpits and quickly offered the pilots a 48% increase over four years with up to 28% upfront. The large increase in pay and the loss of many of its frequent fliers, especially business travelers, started United on the road to bankruptcy. Coupled with the terrorist attacks of September 11th, 2001 and the resulting economic and tourism downturn, United's economic woes went from bad to worse. Operation Bojinka and September 11th Operation Bojinka, Ramzi Yousef and Khalid Sheik Mohammed's plot against a large number of airliners targeted eight United aircraft flying transpacific routes on January 21, 1995. While this attack was prevented by an apartment fire in Manila, a "descendant" of the project perfected by Sheik Mohammed would cause death on United aircraft six years later. As part of the September 11, 2001 Terrorist Attack, two United Airlines planes were hijacked, a Boeing 767-222 (Flight 175) that crashed into one of the twin towers of the World Trade Center in New York City, and a Boeing 757-222 (Flight 93) that crashed in rural Pennsylvania. The latter was suspected to have been directed towards either the White House or the United States Capitol building. Bankruptcy and reorganization United, with a strong presence on the West coast, benefited from the dot-com boom, which boosted traffic (especially premium traffic) to its San Francisco hub. This increase was only temporary unfortunately, and when the 'bubble' finally burst, United was in a worse position before because it had failed to keep its costs under control. Coupled with a battered network (after the dot-com bust) and the September 11 attacks, the company lost $2.14 billion in 2001 on revenues of $16.14 billion. In the same year United applied for a $1.5 billion loan guarantee from the federal Air Transportation Stabilization Board established in the wake of the September 11 attacks. When the application was rejected in late 2002, the company was forced to seek debtor-in-possession financing from commercial sources to cover the expected future losses. Unable to secure additional capital, UAL Corporation filed for chapter 11 protection against bankruptcy in December. The ESOP was terminated, although by then its shares had become virtually worthless. Blame for the bankruptcy has fallen on the events of September 11, which triggered financial crisis in all the major North American airlines. However, the rise of low-cost carriers, labor disputes, and problems within the management structure of the company also contributed significantly. United continued operations during its bankruptcy, but was forced to cut its costs drastically and under delicate terms. Tens of thousands of workers were furloughed, and all city ticket offices in the US closed. It cancelled several existing and planned routes, and eliminated its entire Latin American gateway and flight crew base at Miami International Airport after March 1, 2004. At the same time, the airline continued to invest in new projects. On November 12, 2003, it launched a new low-cost carrier, Ted, to compete with other low-cost airlines. In 2004 it launched its luxury "p.s." (for "premium service") service on re-configured 757s from JFK Airport in New York City to Los Angeles and San Francisco. The service was targeted to business customers and high-end leisure customers in the coast-to-coast market. On December 9, 2004, the airline made history when UA869 (747-400) landed at Ho Chi Minh City, Vietnam. The scheduled flight from San Francisco via Hong Kong was the first by a U.S. airline since the end of the Vietnam War, when Pan Am halted service shortly before the fall of Saigon. Financial pressure on the airline was heavy. The SARS epidemic in 2003 depressed traffic on United's extensive Pacific network. The soaring cost of jet fuel ate away remaining profits. United made, withdrew, and followed several fare hikes on overseas routes, citing rising fuel costs, in 2004 and 2005. Indeed, two days after its triumphant first flight to Vietnam, United announced that it would cut U.S. flight capacity by 14% after the holidays and add more international flights, which were more profitable. United took advantage of its Chapter 11 status to negotiate hard-to-cut costs with employees, suppliers, and contractors, including cancellation of feeder contracts with United Express Atlantic Coast Airlines (which became Independence Air) and Air Wisconsin (which became a US Airways Express carrier). Most controversial of all, however, was the 2005 cancellation of its pension plan, the largest such default in U.S. corporate history. It renegotiated its contracts with the pilots' and mechanics' unions for lower pay; however, the Association of Flight Attendants resisted until the bankruptcy court ruled in United's favor. Criticism was also leveled at the CEO, Glenn Tilton, for demanding pay cuts from employees while receiving the highest salary of any major U.S. airline CEO . Although Tilton's salary was the highest in the industry, his pay mix did not include the level of stock options and bonuses granted to his counterparts. Originally slated to exit bankruptcy protection after 2� years in the third quarter of 2005, United requested yet another extension in light of record-high fuel prices. On August 26, 2005, the bankruptcy court extended the airline's exclusive right to file a reorganization plan to November 1, although it also stated firmly this extension would be the last. United announced at the same time it had raised $3 billion in exit financing and filed its Plan of Reorganization, as announced, on September 7, 2005. The bankruptcy court approved the restructuring plan on January 20, 2006, clearing the way for United to exit bankruptcy on February 1, 2006, and finally return to normal operations. Its emergence as a smaller, much more efficient carrier has in turn put additional pressure on its competitors to reduce costs and capacity. On July 16th, 2006, United Airlines announced after months of speculation that it would be moving its headquarters from suburban Elk Grove Village to the Chicago Loop. The Top 350 Executives will be moving to 77 Wacker Drive. The Elk Grove Village campus will be known as the Operations Center.